Motorbike safari in India is done on various roads of Garhwal Himalayas, Himachal, J&K and more. Bikers should be prepared for valleys, rivers, sunset, sunrise, flowers, animals, birds, etc of Spiti, Kinnaur, Manali, Shimla, Leh, Ladakh, and this is not the end of the list. However evident these may be, one cannot be ever that ready for unburdened beauty. Pure-hearted and simple people drenched in the colour of their unique culture are also a major attraction during India motorbike safari tours to be savoured. Roads are all about the journey needed to know life, which is what Motorbike safari holidays will take the riders to; and one of the best terrains to go motor biking is Himalayas. The bumpy ride on the stony path seems like one road to Nature’s beauty and heaven. Knowledge about acute mountain sickness (AMS) and acclimatization is crucial before getting set for the biking safari. Add some of the arrangements to be taken care of include understanding basic mechanics of bike, packing extra fuel and spare mechanic parts along with light and ready to eat meals. Flexibility with itinerary is another requisite due to the unexpected turn mountain climate could take. For foreign nationals who are on motor biking trip in India, there are certain prerequisites to be fulfilled. They have to have International Driving Licence, passport size photographs and copy of their passport and valid Indian Visa. Carrying these essentials is mandatory for this exciting escapade on road to be carried on, but not for Indian Nationals. It is absolutely hassle free for them to take on the less-trodden roads in Indian mountains! 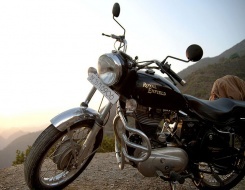 Camaraderie and inquisitiveness will make for a perfect road trip while Motorbiking in India. Are you ready to take the adventure as opportunity to handshake with life!